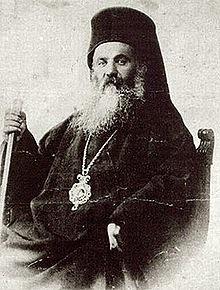 Born in Triglia, Bithynia in 1867, Chrysostomos showed early promise in the Church, being appointed Metropolitan of Drama in eastern Macedonia in 1902, at the relatively early age for a bishop of 35. At that time, the area was still under Ottoman rule and his main concern was the spiritual and physical care of the majority Orthodox Greek population. He involved himself in the building of schools, churches, hospitals and even sports facilities and these actions, together with his tendency to make political statements, resulted in exile in 1907 and again in 1909. In 1910, he was elected Metropolitan of Smyrna (now called Izmir) on the east coast of Turkey. This also had a large Greek Orthodox population and, here too, he combined church duties with social and charity work* and vociferous opposition to the persecution of Turkish Christians. He organized a full day rally against the violence of the Bulgarians against the Greeks in Macedonia, which was condoned and perhaps encouraged by the Turkish government. He spoke to diplomats and the world press, and the German ambassador in Constantinople was so impressed by his efforts that he described him as “the best of living clerics.” He was again exiled to Constantinople in 1914, not returning to Smyrna until 1919. God is testing our faith, our courage, and our patience at this time. But God will never abandon Christians. It is in turbulent seas that the good sailor stands out, and it is during a time of tribulations that the good Christian does the same. Pray and all this will be gone. We shall again see happy days and we will pray to the Lord. Have courage as all good Christians should. Metropolitan Chrysostomos was officially canonised by the Church of Greece in 1993, with a feast day on 27 August. Later, however, the celebration was moved to the Sunday before the Elevation of the Cross, when he is remembered along with the other new martyrs of Asia Minor. Since the seat of the Ecumenical Patriarch remains in Istanbul (Constantinople), for diplomatic reasons these saints are not commemorated in the Ecumenical Patriarchate. * Intriguingly, Chrysostomos was the founder of the original Panionios football team in Smyrna. After the expulsions of 1922, the team was reconstituted by the refugees in Nea Smyrni in Athens, where it continues to this day. *** To be fair to the officer, in spite of the humanitarian instincts of his men, it is doubtful if they could have done much to protect the metropolitan and would probably have perished themselves in the hysteria of the attack. My father was a young soldier in the British “peacekeeping” force in Smyrna in 1922. He told me that, whatever horrors they witnessed, the British troops were also strictly ordered not to intervene unless attacked themselves.